I’ve been meaning to review this ever since I finished it, but was sidetracked by my university reading – the first book of which is Frankenstein that I finished about three minutes ago. And I’m very glad I chose to read it, one of the reasons being that I realised how V.E Schwab uses the story of Frankenstein in her book. Victor and Eli started out as college roommates brilliant, arrogant, lonely boys who recognized the same ambition in each other. A shared interest in adrenaline, near-death experiences, and seemingly supernatural events reveals an intriguing possibility: that under the right conditions, someone could develop extraordinary abilities. But when their thesis moves from the academic to the experimental, things go horribly wrong. Ten years later, Victor breaks out of prison, determined to catch up to his old friend (now foe), aided by a young girl with a stunning ability. Meanwhile, Eli is on a mission to eradicate every other super-powered person that he can find aside from his sidekick, an enigmatic woman with an unbreakable will. Armed with terrible power on both sides, driven by the memory of betrayal and loss, the arch-nemeses have set a course for revenge but who will be left alive at the end? I will just say now, that I will have a short spoiler section at the end of this review, but there will be plenty of warning before you see it. I’ll also be talking about Frankenstein in this section. Are we surprised this is yet another fantasy novel? No. Probably should rename this blog ‘alwayslovetoreadalotoffantasy’. Back to the book, Vicious is the superhero book I’ve always wanted to read (and write). I’ve always loved the concept of superheroes, ever since watching The Incredibles when I was a child up until recently reading All My Friends Are Superheroes by Andrew Kaufman. 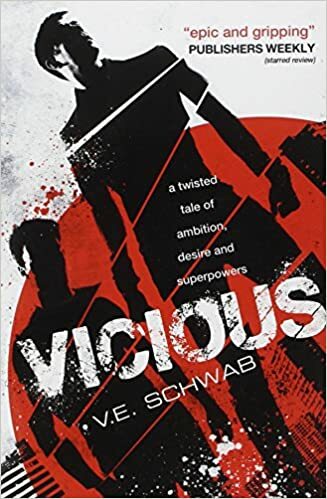 Vicious is a book about superheroes for adults – and the term ‘superheroes’ is one I use loosely, particularly the ‘heroes’ part. This book turns every idea you have about superheroes on its head. It turns the concept of who is ‘good’ and who is ‘bad’, who the ‘hero’ is and who the ‘villain’ is, completely upside down. The book follows Eli and Victor, who start off as friends and become enemies. The layout of the novel is gripping, jumping back and forth between the past and present to slowly unravel what the hell is actually going on and how it got to this point. You see Eli and Victor as teenagers, full of curiosity and ambition, then the next page you see them as adults, entirely vengeful. Not only do you have such complex main characters, but the ‘sidekicks’ all have their intricate backgrounds and even more interesting abilities. I loved seeing the different relationships, especially that of the sisters and how their abilities affected their relationship. I don’t want to say so much more on this, because I’m pretty sure I’m going to spoil it. Which means, it’s time for some spoilers. Along with some Frankenstein context. For those of you stopping here though, if you enjoy anything fantasy, with action, revenge, and fantastic characters – this is the book for you. So first of all the first character we meet is Victor, likely named after Victor Frankenstein, and he has an interest in all things science. Through experiments, he creates a monster within his friend Eli, bringing him to life after almost killing him. Then Eli goes on a killing rampage, not to mention how he charms everyone with words – also known as the female sidekick he picks up along the way – just as Victor Frankenstein warns his friend that the monster’s eloquence with speech is not to be trusted. The story is shown from both perspectives, just as the monster gets to share his story, and you don’t know whether you like either of them whilst reading. Hell, Sydney’s power is bringing things back to life. Hello, Frankenstein! Once I finished Frankenstein, I keep noticing more and more similarities and then can only appreciate Vicious even more. I mean, come on, it’s fantastic! And that ending? Perfection. Pretty sure that Sydney, with her dog of course, is my favourite character – but Mitch comes a close second. What more can I say? I loved this book, but reading Frankenstein made me love it even more. Top marks, Schwab.